Filter by Standard Steam Gift Deluxe Ed. Attention: This product is a Steam key from Mutant Year Zero: Road to Eden (although it may also be available in other versions such as the Steam Gift), depending on which store you buy. Each of the available formats must be activated in a certain way, so from Gocdkeys we recommend paying attention to details and information on activation of this type of formats. Mutant Year Zero places us in a post-human world, reconquered by nature and the mutants derived from the radiation of the last human wars. This is a tactical adventure game that combines turn-based combat and reminds us in certain aspects of games like XCOM, with elements of exploration. The world as we knew it has disappeared. The last human wars unfolded all the nuclear potential and devastated the Earth, causing the few survivors to mutate and become a new species that now dominates the Earth. Nature has also taken what humans once took from it, and ancient cities are now covered with grasses and forests. Now, we must explore the ancient ruins in search of all kinds of resources, food and objects that can help us survive in this difficult world. The game features a deep, turn-based tactical combat system inspired by XCOM games. It travels through a post-human world of abandoned cities, crumbling highways and rural areas covered with vegetation. Stealth will also play an important role, as it will allow us to carry out undetected missions, such as infiltrating an enemy camp, positioning the mutant team and ultimately making use of the element of surprise. As we move forward, we will be able to unlock new mutations and abilities for our characters. The armament section also offers an enormous amount of possibilities, from improvised slingshots to high-powered rifles. 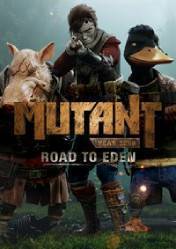 There are no comments yet about Mutant Year Zero: Road to Eden. You can be the first one! I played the Mutant Year Zero: Road to Eden Demo/Beta. This is Part 1.